Submitted by lynn on Monday, July 9, 2018 - 6:25pm. 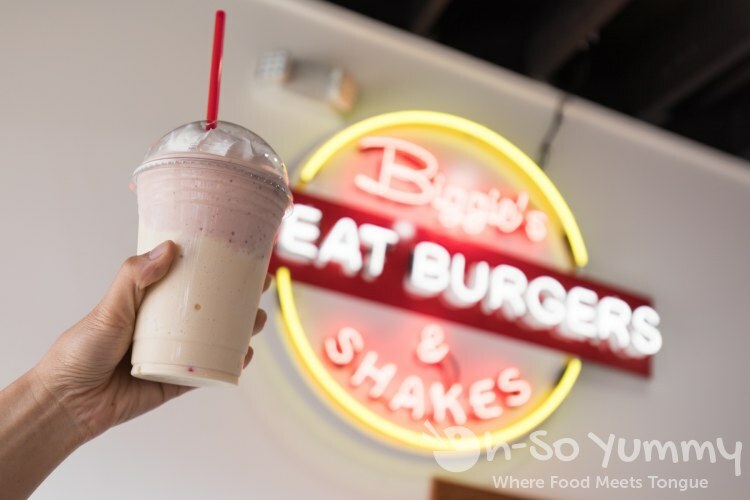 Dennis and I recently checked out Biggie's Burgers (as media) in the heart of Pacific Beach. 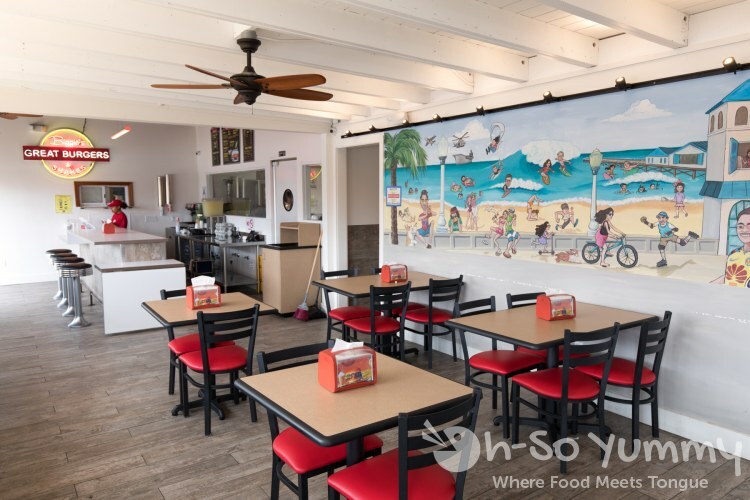 They have one other location in San Clemente and most recently opened this San Diego location. 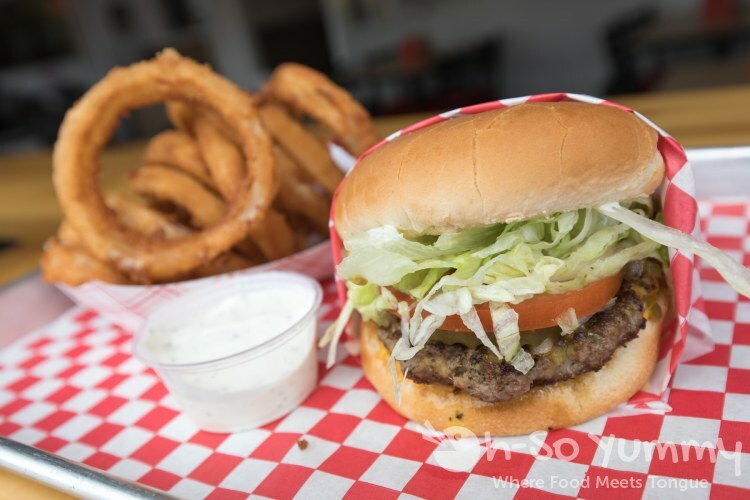 Biggie's Burgers is your family friendly, alcohol free spot with a classic american food menu while near the beach. There's even a large television where you could watch the local sports such as the recent soccer games. Across the Mission Boulevard street are popular boozy brunch spots like Duck Dive brunch (bottomless mimosas), etc. The roomy restaurant has multiple tables spread throughout the dining room. In addition, there's an open window seating that faces outward in the direction of the ocean. These counter height seats give a simple view of the busy beach street but might be a bit high for the little ones. Service was quick and friendly. Along the ordering counter wall, it showed the basic building blocks of the burger which you can customize to your liking. To get a feel of the menu, we ordered one combo meal which included a burger, side and a shake. I chose the classic burger so we could baseline the food. Dennis added a little fun flavor by choosing the BBQ burger. You save $2-3 with a combo. The handmade shake comes in strawberry, vanilla or chocolate. Dennis requested a mix of strawberry/vanilla because he doesn't like to stick with one flavor. These are made with real ice cream and were frosty sweet. By the time we had finished ordering and sat down, that shake was already set out in front of us! The made-to-order food was still cooking so we couldn't get pictures of all three in one shot. Sorry you'll just have to imagine it! My burger was nice and clean with some sauce similar to a thousand island. You can choose raw onions or grilled onions (my preference) which were a great addition. The handmade patty was cooked through but seemed on the leaner side. Dennis mentioned it was not as satisfying as a greasy burger but at least you don't feel guilty either! The bread itself was plain, a little thicker and didn't seem to have much toast to it. This comfort burger reminded me of a bigger In N Out. The patty was a third pound plus with sides made for a very filling meal. Dennis got the BBQ Burger which came with barbecue sauce, bacon, and crispy onion strings. 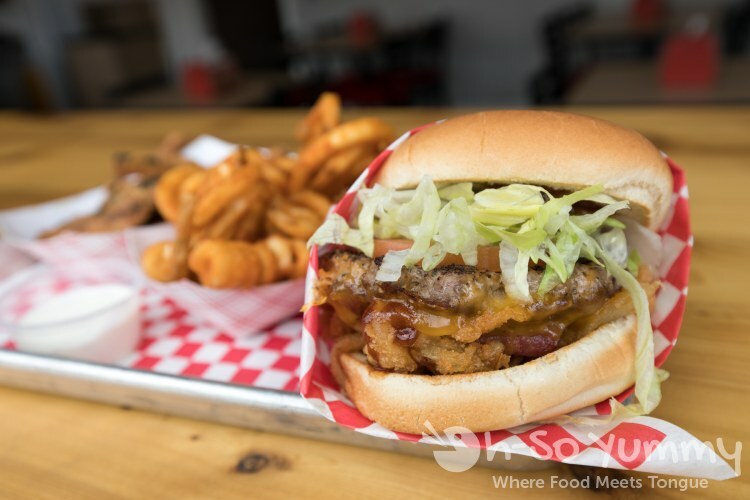 We always love these Texas style BBQ burgers, especially that slight crunch from the onion straws. The sauce was slightly sweet and pulled everything together! The meat was the same as the previous burger. 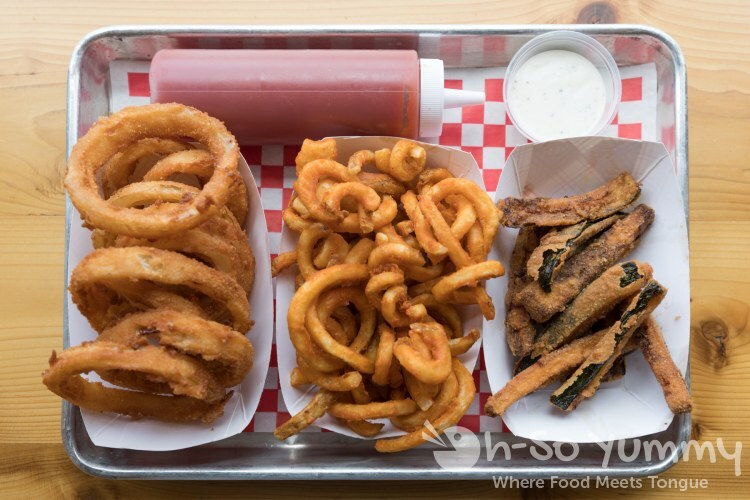 For the sides, we picked curly fries, onion rings, and fried zucchini sticks. The curly fries had the right amount of zest to it plus I love a delicate fry outside with slightly packed potato insides. These were enough to share for two. The handmade onion rings were very crispy and not too oily around the sweet onions. They were accomapnied by ranch sauce which Dennis liked for its thicker consistency and flavor. The last item was the fried zucchini which was another of their handmade items. I found it slightly bitter for my tastes though Dennis thought they were just fine. Overall they were a bit oily so we preferred the other two, especially with the $4 price tag. Overall, we thought this was a nice little classic diner. 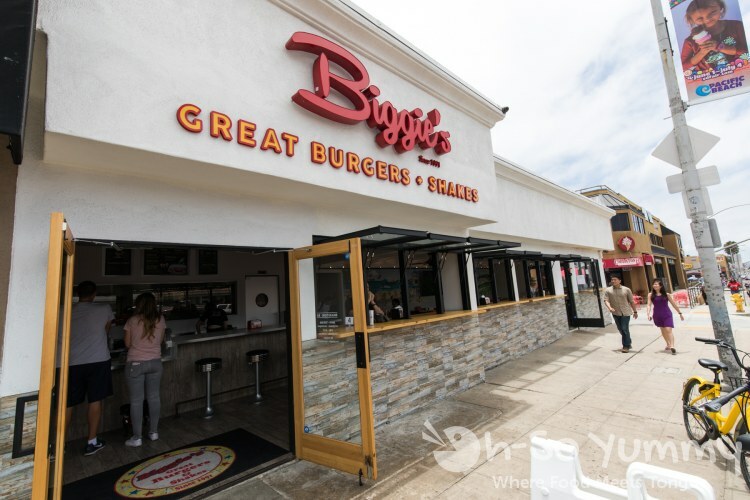 It's got what you need, some great burgers and fries plus a cool view of Pacific Beach, including the famous Slo Mo along the right side skating along the boardwalk. Of course, I'm referring to this fab mural but we're only steps away from the busy Mission Boulevard as well as a block from the beautiful ocean. Take your burger, fries and shake out for a stroll if you'd like. I'd be down with that.